This is a fixed 50-line slot and offers the popular Extra Spin feature with added wilds. 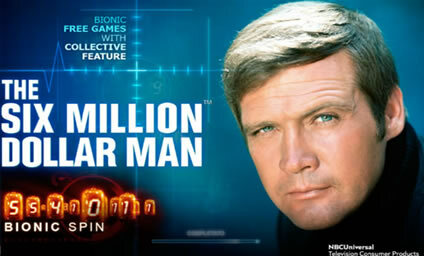 The Six Million Dollar Man Slot at Fly Casino also offers stacked wilds that can appear on all 5 reels. This design can return some huge payouts! Not to forget the Bionic Bonus feature. Hit 3 of the scatter symbols and 15 free spins will be yours with the chance to win extra free spins as well. The time to find the inner bionic man in you is this weekend at Fly Casino. Have a great time playing this popular slot! Saturday March 22, 2014 00:00GMT until 23:59GMT on your first deposit of $/£/€10 or more our members are eligible for our exciting Your Choice bonus. All members that have deposited at least $250 in March are invited to write support@flycasino.com on March 24, 2014 from 00:00 GMT until 23:59GMT, to be credited with 25.00 free slot wagering!! You must wager 10X the bonus on slots with $500 maximum winnings. On Tuesday March 25, 2014 from 00:00GMT until 23:59 GMT all members on their first deposit of $/£/€30 or more are able to receive a 144% deposit bonus up to $/£/€288.00.